Where's your compact system camera? 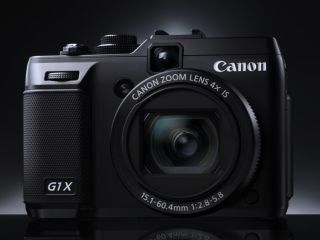 The Canon G1 X: for 'fanboys' only? James Loader, product manager for the Nikon Coolpix range of compact cameras says he was shocked by Canon's new premium compact camera, the G1 X, admitting that he was expecting to see a compact system camera first. The Canon G1 X was launched by the company during CES 2012 and features a large sensor which is almost the same height as APS-C sensors found in many DSLRs. The majority of camera manufacturers now have a mirrorless model in the market, with Nikon being one of the newest players to enter the market in September 2011 with the Nikon 1 series comprising of the V1 and J1. There have been persistent rumours that Canon would soon follow Nikon into the CSC market, but as of yet, there has been nothing revealed. Speaking to TechRadar at the launch of the latest range of Coolpix cameras, Loader said of the G1 X, "I was a little bit surprised. I thought we'd see the compact system camera first. A lot of people seem to think that the sensor inside that is what they will eventually use in a possible future CSC camera." "The G1 X, at that price point, is a super kind of niche market, just for Canon fanboys if I'm completely honest. It's not something that I anticipated from them." With compact system camera rivals including Sony, Samsung, Olympus, Panasonic, Pentax, Fuji and of course Nikon, Loader doesn't think it will be long before Canon steps up to the plate too. "It's too big a market for them to miss out on, isn't it?" he said, "I don't think they would be happy to let Nikon and Panasonic and all the other competitors take the lead on this." Many people are expecting to see new releases at this week's CP+ photography trade show taking place in Japan, however there have been no credible rumours that Canon will enter the mirrorless market imminently.